If you use Active Directory within your organization then you can include this in your network scan. 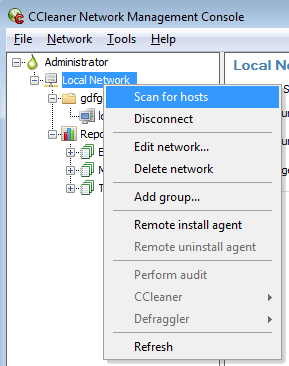 Click on Network > Remote Installation in the main menu. Enter the user credentials with sufficient access rights to list the computers in the Operational Unit you wish to maintain. Click on Network > Active Directory and enter the LDAP path of the Operational Unit you wish to maintain and link credentials entered in step 1. [DomainController] - This is the name of the Domain Controller. [Port] - Port on which the Domain Controller handles (default is 389). [OperationalUnitPath] - The path from the root to the Operational Unit one wants to list. [DomainPath] - The Domain in which the Operational Unit is located. This corresponds to the "developers" operational unit which is located in the "computers OU" and they belong to the "piriform.com" domain.